December silver futures steadied yesterday following Friday’s sharp sell off in the commodities sector as the markets reacted to the fundamental data from China, which gave clear signals that inflation in the Chinese economy was increasing, raising the prospect of an interest rate rise and a subsequent slow down in demand for this key industrial metal. Along with copper, silver is one of the key materials on which the economic growth in China has been based, and is therefore particularly sensitive to any economic data from the region, and as a result we saw silver prices fall dramatically on Friday, breaking below the 9 day moving average and closing marginally above the 14 day moving average immediately below. 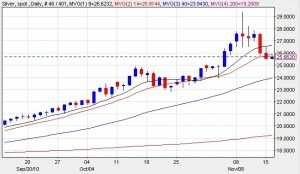 Yesterday’s price action was muted in contrast, ending with a doji candle as the markets paused, but generally reacting positively to the news that China had decided to keep rates on hold for the time being, with the December silver futures contract closing above the 14 day moving average once again. The reversal for silver came as no great surprise and indeed I had forecast this last week, following the steep shooting star candle on the daily spot silver chart, which gave us a clear signal that the market was about to turn. The question now of course is how far silver prices will retrace, before continuing the longer term upwards trend, and for this we need to consider the 40 day moving average and potential support below. The first of these is the support area in the $25 per ounce region, which should provide a platform of support and prevent a further move lower, whilst any breach here could open the way to a test of the 40 day moving average at the 23.94 price handle below. Given the depth of the price congestion below, then this should prevent any further fall, and as such we can expect to see silver prices recover and regain the upwards momentum of the last few months. As such, the first step is a break and hold above the 9 and 14 day moving averages, which would then see the commodity recover to $27 per ounce and beyond in due course.